It’s time for our Lake Rudolph Open House! This year will be our 9th annual and it will take place this Saturday, June 5, from 11:00 a.m. – 2:00 p.m. CDT. Everyone is invited to take free guided hayride tours of the resort. A hayride tour … how fun is that? Weather permitting of course. If it rains, we’ll use the Lake Rudolph shuttle instead. All tours of the campground will include our popular rental RVs and cabins, as well as tours of our new Super King Size Rental RVs! And we have a special treat … the tour will also include the new Rudolph’s Christmas Cabin display model. We’ll have this cabin model open for all our guests to tour throughout 2010. We plan to construct up to 50 of these new cabins for the 2011 season! We’ll just say that I showed my Mom around one last weekend and she said, “I could live in this cabin.” They will be nice. We’ll also have FREE hamburgers and hot dogs between Noon and 2:00 p.m. CDT courtesy of Tom Raper RVs from Richmond, Indiana. Tom Raper will have several units on display and their employees will be giving away prizes. Come out and help us celebrate the start of summer! And hey, free hamburgers, hot dogs and prizes can’t hurt right? Pour peaches in bottom of 14″ Dutch oven. Sprinkle cake mix over top of fruit. Do not stir. Cut pats of butter and place evenly on surface. Cover and bake over medium heat until bubbly and top is lightly browned, approximately 30-45 minutes. Break out the barbie … Memorial Day weekend is only a few days away! This is one of my favorite family holidays because it means summer is here! If you’re visiting us this weekend I’ve posted our Memorial Day Weekend amenities and activities schedule below. Enjoy! Pizza, ice cream, shakes & slushies. Call in or carry out. 812-937-3772. Cool off in Blitzen Bay Pool! The little ones will enjoy Baby Blitzen. Forget something … our well-stocked Camp Store is sure to have what you need! The Tooth Fairy, featuring Dwayne Johnson, Ashley Judd, Julie Andrews, and Billy Crystal. Located in the Outdoor Pavilion. A 30-minute non-denominational church service. Show off your singing skills! Located in the Outdoor Pavilion. And don’t forget the visit the Santa Claus Christmas Store while you’re in Santa Claus! It opens daily at 10:00 a.m. CDT. Did you all know that this year is the centennial of the RV?! The RV industry is celebrating 100 years this year; 1910 – 2010. I remember my first RV trip with my family. It was to Lincoln State Park and we also went to Holiday World. We rode our bikes around Lincoln State Park I don’t know how many times. The following images are courtesy of collections of Al Hesselbart and the RV/MH Hall of Fame and Museum. They were some of my favorites on the Centennial site. Enjoy! I also put in a photo of our new Super King Size Rentals RVs. All I have to say is … thank goodness the RV industry has come a long way!! Tropical Chicken for this week’s Rudy Recipe. Okay, it just sounds fun (and tasty) to me. Season chicken as desired and grill. When done, leave chicken on grill and top with ham and pineapple. Cover with slices of Mozzarella cheese. When cheese is melted, remove from grill and serve. Now for the second portion of our camping tips for the 2010 season. For all you RVers out there it’s time to get rolling! We’ve gathered a few tips from our employees, BetterRVing, KOA, and helpful other sites. It’s always a good idea to have your RV thoroughly checked out before taking off for the season. You know, the routine maintenance that you need to keep that baby running smoothly. Tire pressure check, oil change, etc. Call the RV park or campground where you wish to stay and make reservations. Or reserve online. Don’t assume that they will have space available. Especially on weekends or holidays. There is an art to packing your RV. When loading an RV, you want to place the heaviest weight in the center between the front and rear axles. Putting heavy objects in the lower compartments and the middle keeps a good center of gravity, which will help you conserve fuel. The amount of weight you’re hauling will affect gas mileage. It sounds silly, but if you’re a new RVer you should really take the time to read your manuals. Those things are printed for a reason; I promise. Even if you’re not a new RVer … read the manuals. Did you know that only about 10% of RV owners have read their manual? – Check your appliances at least once a year. – Flush the holding tanks after each trip. – Understand the amp ratings of all your appliances. – Don’t always run your fridge on electricity; switch to LP occasionally. – Always leave enough space for air to circulate around the food in your fridge. – Use distilled water in your batteries and brush the terminal connections to keep them clean. – Check tire pressure before and after each trip; and check for cracks in the sidewalls of your tires. Once again, pretty standard tips … but helpful none the less. Here’s a treat … fun RV Aps for your iPhone. This week Rudy’s Recipe is Banana Boats. These sound so good that my stomach growled while typing it up! Peel a banana back but don’t pull the peel completely off. Slice it longways so it looks like a hot dog bun. Put marshmallows, chocolate bar pieces, and chocolate syrup in the sliced area. Then wrap the banana back up in its peel. Wrap the banana in foil and put in the hot coals. Leave for about 10 minutes. Unwrap the foil and the banana peel and enjoy. 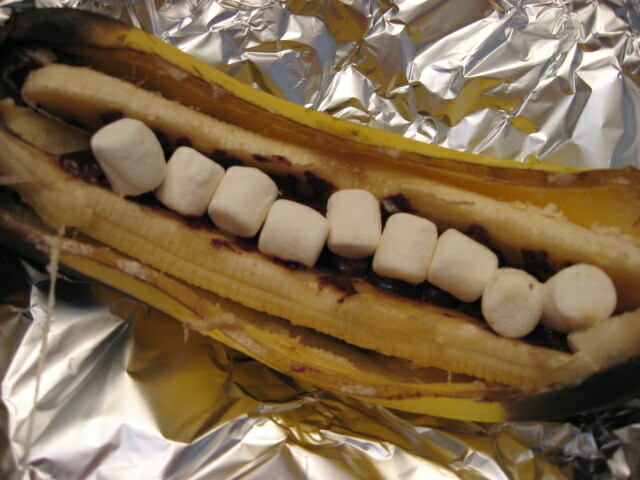 The banana is so soft, along with the melted marshmallows and chocolate. Photos of the continued office construction. We should have siding and trim soon! The windows and doors are framed up inside and it’s really starting to take shape. This Thursday we will start taking online reservations for our 2011 season. There’s a little perk involved if you make your reservation for 2011 early and online. That perk would be a FREE $200 Lake Rudolph gift card! Make a 2011 reservation, online only, anytime from 8:00 a.m. CDT on May 13 until 8:00 a.m. CDT May 17. The names will then be entered into a drawing for the gift card. Reservations must be made using our online reservation system. You must be 21 to make a reservation. We’ll start accepting reservations for 2011 by phone on Monday, May 17. 1-877-478-3657. I’ve heard the saying, “Bacon makes everything better.” So how about corn on the cob? Try anything once I always say. Rudy’s Recipe this week is Corn on the Cob, wrapped in bacon and grilled over the campfire. Sprinkle each ear of corn generously with Parmesan cheese. Wrap one piece of bacon around each ear of corn. Wrap each cob securely in aluminum foil; twisting the ends. Cook on the rack over the campfire or on the grill, turning often, for about 35 minutes. Don’t worry about salt or butter; the bacon takes care of that!